I’m often contacted by Arachnid and millipede owners who are concerned about the tiny white “specks” that they notice crawling about their terrariums and on their pets. In almost all cases, the little beasts turn out to be relatively harmless Mites. Mites are actually Arachnids, related to spiders and scorpions, and are unique in the incredible diversity they have attained – over 45,000 species have been described, with many more than that likely remaining to be “discovered”. Where Did They Come From, What Are They Doing? It is nearly impossible to prevent Mites from entering one’s collection – even if the terrarium and substrate are sterilized, they will invariably enter as hitchhikers on food insects. 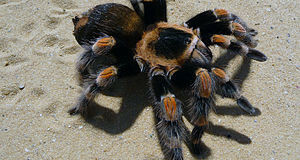 Most Mites are intolerant of dry conditions, and hence rarely appear in enclosures housing Red-Kneed Tarantulas, Desert Hairy Scorpions or other species that hail from arid habitats. The white Mites observed in invertebrate and other terrariums are almost invariably scavengers that feed upon dead crickets and other food insects, animal droppings and decomposing organic material within the substrate. 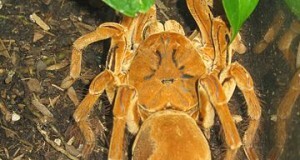 Those seen crawling about tarantulas and other animals are foraging for bits of food. In a sense, they are “cleaning” their hosts…but most pet keepers do not like to see them doing so (nor did visitors to some of the zoo exhibits I’ve worked on)! In rare cases, scavenging Mites may feed upon an invertebrate whose exoskeleton has not hardened after molting, or enter an injured area of the carapace. If large populations are allowed to build up, they may also cause stress by their constant moving about. Parasitic Mites, while common in the wild, do not often seem to invade terrariums. It may be that they are very specific in their choice of hosts. I’ve never run into a Mite problem after using soil, logs or leaves that I have collected, but if you are concerned you might try freezing such items before use. Eradication can be tricky, as products designed to kill Mites will also be toxic to your pets. There are a few options, however – please write in if you have a Parasitic Mite infestation. Mites are best controlled by the routine removal of dead food items and droppings, as their populations skyrocket when such rich food sources are available. In terrariums housing invertebrates that favor moist environments, such as Emperor Scorpions or Giant Bird Eating Spiders, you can allow the substrate to dry out a bit…those Mites that are not killed outright by desiccation may be lured to a jar filled with damp sphagnum moss. 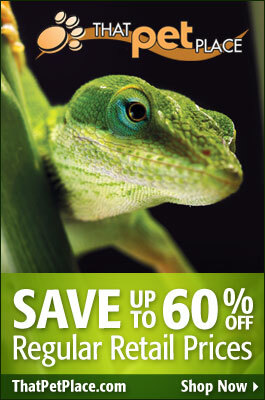 Be sure that your pet is not about to molt or give birth before allowing its terrarium to dry out, and always provide a water bowl or Gel-based Cricket Water Supplement for its use. The decision to dry out a terrarium must be made on an individual basis – if unsure, please write in for more information. All (and maybe more!) that you ever wanted to know about Mite lifestyles and ecology may be found on the website of the US Department of Agriculture. WOW! Even mites seem to be interresting! How can I remove mites from my scorpions back. Can a small group of mites kill him? Hello, I just happened to lose both of my emperor scorpions after having one for almost 2 years and the other about 6 months. I am not completely sure, but have two general ideas: I did have mites, and small fruit natts i believe. I did my best to eliminate the natts, but they always came back, although they were present throughout most of the time so its hard to point it at them. Secondly, around 2-3 weeks prior I cleaned their enclosure, baked all the hides, pieces of wood, rocks and washed the plastics with hot soapy water. Also was going to replace the substrate but realized I purchased “Coco Husk” instead of the “Coco Fiber” I did see a big difference so instead of replacing it completely Ii simply mixed it in with the old coco fiber and moss, really thinking nothing of it…Until now, seems as though my substrate was a little dryer than normal, but nothing extreme. One thing I find interesting is while I had my older emperor, I do not believe he molted a single time.Thoughts? It’s difficult to identify causes of death, as there are many health concerns that have not been studied. 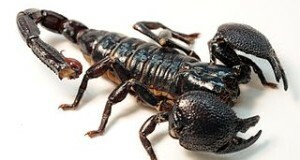 Mites may damage newly-molted scorpions but this is rare. I have learned to bake any new substrate I put into my tarantula’s tank for a few hours at a decent temperature, and I freeze any cages or accessories if I find mites. She spends the week in a “spider motel” (alternative container) while I do this. I love the idea of putting a water-filled moss piece into an infected tank to attract them, by the way. As gross as it sounds, people in the Middle Ages used to do this with a fresh piece of animal fur; the piece of animal fur would attract fleas and mites to it, and then the person would toss the scrap.